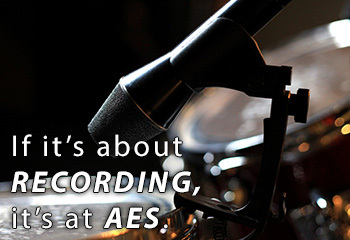 Most discussions of the annual AES convention tend to be about all the amazing gear that is displayed on the exhibit floor. But there are also all the seminars/presentations that feature some of the talented producers and engineers that use the gear to create the iconic music for our favorite artists/bands. The feedback I've received over the last few days says that last weekend's 139th AES 2015 in NYC did not disappoint in this aspect. summed it up quite nicely in his 4 part blog post on his site. Meeting the designers behind some of the great gear that we use daily. The "Platinum Producers-Bad Vibrations" panel which focused more on the emotional instead of the technical side of the music making process. How sometimes unorthodox methods are used to achieve the creative goals of the artist and producer. The creative process of many iconic producers and engineers. "Joe Chiccarelli pointed out on several occasions that he felt he failed in his artistic vision if he hadn’t captured 90% of the desired sound by the time tracking was done!" "John Congleton repeatedly emphasized creativity over gear, experimenting with all kinds of available gear including inexpensive guitar pedals and exploring any possible crazy combination including running his Boss pedals through his Fairchild!" "John admitted that it took him a very long time ((6 or 7 years!) without anyone taking any notice of his artistic work! and stressed that unless there is true creative fire underneath, music may not be worth pursuing, at least not if one is in it to make a living." "Val Garay generously shared a wealth of details about the production techniques for James Taylor’s “JT” album and Kim Carnes “Bette Davis Eyes” single, including the exact types of microphones used for drums and vocals and their placement. To note: he loves a pair of elam251s as drum overheads and u67 for vocal, tracked through an early API console." the personal stories revolving around John & Yoko, such as John explaining how to write a hit song: “Speak the truth and make it rhyme!” were first-rate. (In the past I've heard that Stevie Wonder used to keep tape recorders in every room in his house so he could lay down a song idea whenever and wherever his creative muse kicked in).